What is standing in your way of being at the top of your fitness game? Chances are when you get to the end of this article you’ll have no excuse left and you’ll be on your way to get yourself a fold away exercise bike. That’s how impressive and convenient this piece of fitness equipment is. But then you need to pick the right one of course. And that’s what we’re going to help you with. Just keep reading. You’ve probably seen exercise bikes in gyms and even in other people’s homes. Or perhaps you’re thinking of replacing your old exercise bike. 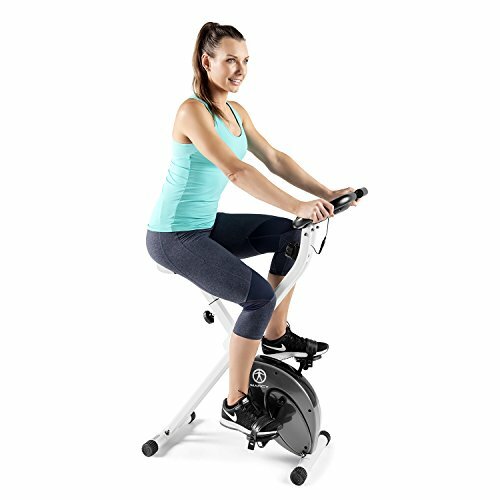 Here’s a handy tip: A foldable exercise bike has most of the benefits traditional exercise bikes have but you don’t have to sacrifice space in your home anymore. 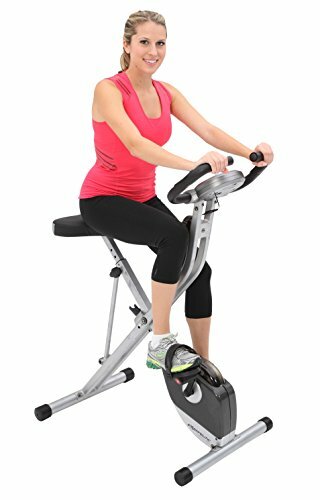 A fold up exercise bike looks like a regular bike but it’s used in a stationary position. 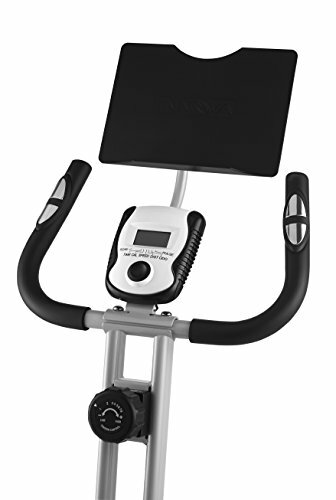 You can cycle while the settings you pick on the console or on the motor determine the resistance you’ll experience and therefore how much energy you burn up. 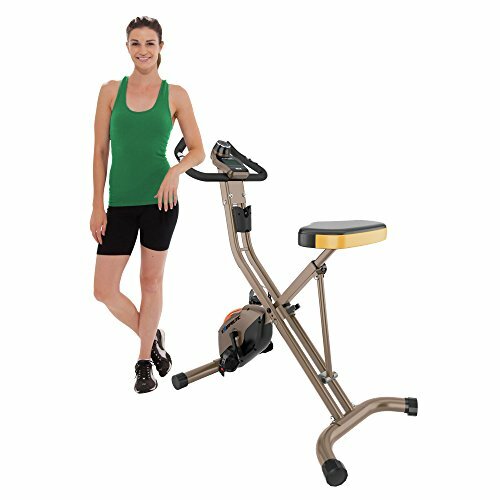 The added benefit of picking a folding exercise bike rather than traditional exercise bike is that these units can easily fold up to be placed in storage. Both in size and weight they’re designed for easy portability, so you can slide them through doorways in your home effortlessly. This combination of efficacy and portability comes with a range of benefits. Get fit: Firstly, you should consider this if you don’t have a fitness routine at all. This is an effortless way to improve cardio health and build your muscles. Just because it’s a mobile option doesn’t mean it won’t be as effective as other, larger machines. Flexibility: An exercise bike can be used at any time and in any weather. Your daily fitness routine doesn’t have to be weather dependent anymore. Budget friendly: The folding exercise bike market has many affordable options that make it possible for almost anyone to own one. It’s a much more affordable exercise option than a monthly gym membership. That means when you pick yours from the list below you’ll be saving money in the long run. Space saving: You don’t have to sacrifice space as with many other exercise equipment options. It’s compact so it doesn’t take up much floor space and after your workout you can simply place it in a closet. Quiet: These machines are usually very quiet thanks to modern technology, so you won’t wake up the family if you exercise early in the morning while everyone is still asleep. 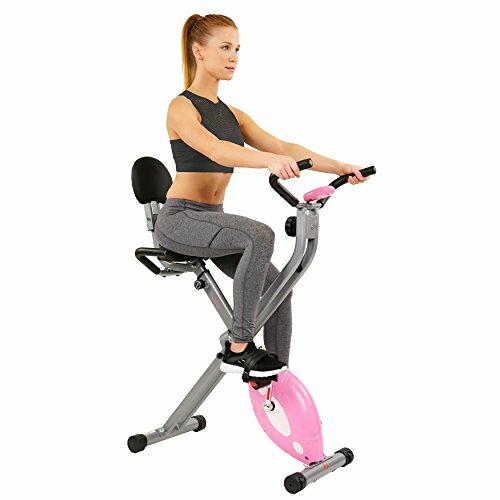 Joint friendly: If you’re concerned about how regular exercise negatively impacts joints, you should consider a fold up exercise bike because they don’t place much pressure on your body as jogging or lifting weights will do. Sounds like the right option don’t you think? Now let’s look at the best ones on today’s market. You need to feel secure once you’re in your seat and with this bike you can depend on the sturdy heavy duty, durable steel frame. Sturdiness doesn’t mean it’s bulky. This folds up to half its original size which makes storage possible in almost any size home. It’s sturdy but also comfortable thanks to a soft seat. 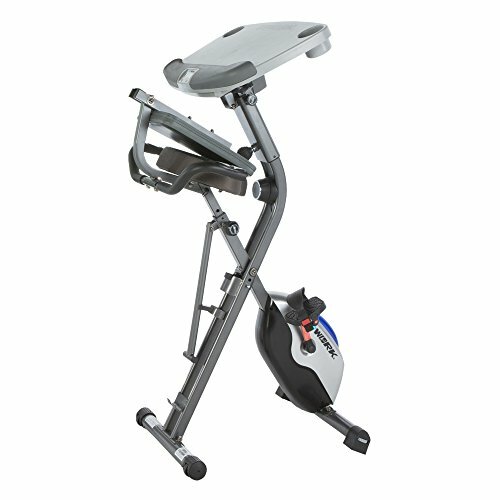 It even has large pedals; these are for safe peddling but also comfort and to make you feel secure while you exercise. It helps you monitor your health since you can gauge burned calories, distance covered, your time, speed and your pulse on the LCD display. 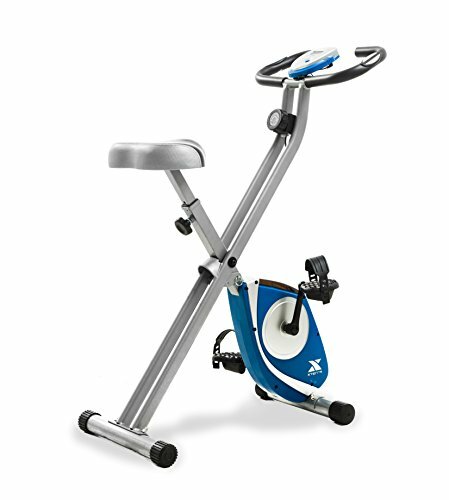 This is a magnetic tension control bike which means it can work for beginners and more experienced users. Just note that extremely short individuals may not be able to reach the pedals. When you’re done you can use the transportation wheels to slide it into storage. Unfortunately, it only has a one-year warranty. You also need to assemble it yourself which can be challenging, and parts often get lost during transport. Check current price. This is not simply an exercise bike but the solution to maintaining a healthy lifestyle if you always have too much work to do. 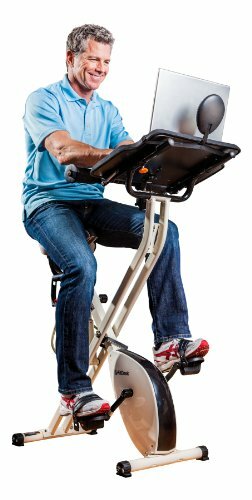 This exercise bike has as sliding desktop so you can use your laptop or write while you burn calories. This is a semi recumbent style which some users find very comfortable and which allows you to find a practical working position while you peddle. You can make yourself comfortable on a 2.5” thick seat and it has a back rest for optimum support. However, these aren’t very adjustable. If the placement doesn’t suit you it can become uncomfortable especially if you sit for a long time. Check current price. 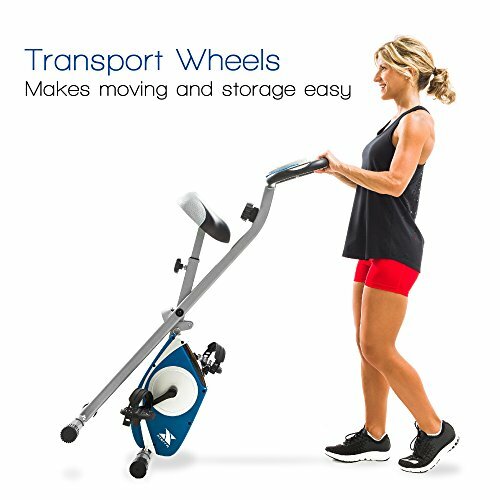 Here you have one of the lighter models on this list which already makes it easier to transport around the room or house. It will fold up to half its size so you can find space for it in a closet. It’s a cross between an upright and recumbent bike which is a great idea but some users find it less comfortable than using the one or the other. Often the pedals are simply too far and awkwardly positioned to enjoy your workout. This limits full range of motion which will affect how effective your routine is. The handles have pulse sensors to track your heart beat and you can track your progress on the LCD display. This is one of the more affordable bikes on this list. Unfortunately it means even though it’s still a quality option it won’t feel as sturdy as some of the others. Check current price. 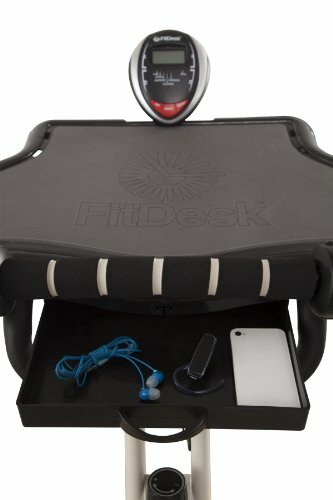 Do you want some style in your room when you exercise? This design has a funky pink body so it’s the perfect gift for a lady. You can use this almost anywhere - even wooden flooring - without the fear of sliding thanks to the nonskid foot pedals. When it’s time to put it away the wheels make it quick and effortless. There is a comfy seat and back rest but note that the seat can only adjust up or down, not sideways. If the bike doesn’t make for comfortable sitting, there’s not much you can do about it. There is a screen to track your fitness progress but it could be better. It doesn’t take all your details such as your weight into account when calculating statistics. Check current price. 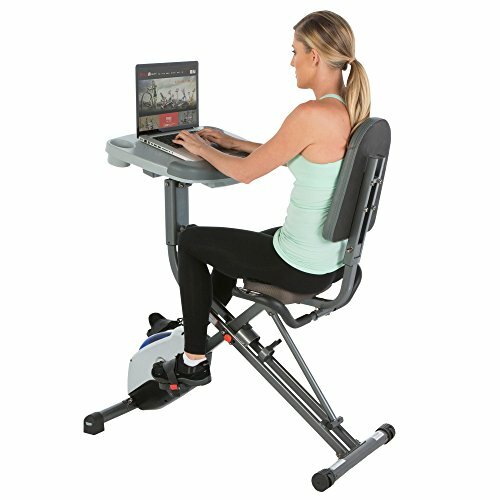 Here is another innovative design that combines a desk and a fitness bike so you can keep updated with work & your exercise routine at the same time. This one’s motor is driven by a twin belt high velocity flywheel. We love the extra features such as the storage drawer and non-slip surface on the workstation. You can focus on pedalling rather than your laptop sliding off because of the bike’s movement. Just note that with your laptop open you won’t be able to view the LCD screen and its data. Unfortunately, this model doesn’t fold up very compactly. It’s also trickier than most to handle which leads to many users leaving it set up rather than placing it on storage. Check current price. This bike is backed by the brand’s more than 30 years of experience, so you’ll find some excellent features. There’s a quiet motor and the wheels at the bottom that help you to effortlessly put it away. It’s also another light model which makes it even more user friendly. 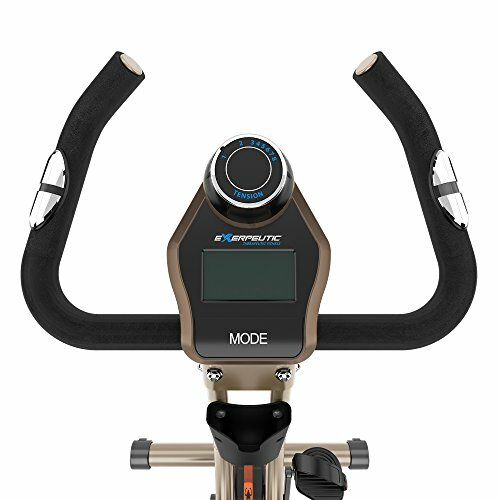 The console is user friendly and along with the assistance of the heart rate pulse grips you get detailed feedback on distance, pulse, speed and more. Don’t think you need a huge bike to get the best workout. This design provides everything, so you can work up a sweat while sitting comfortably on the soft seat. The warranties on this are quite short unfortunately: only 3 months on the parts and 1 year on the frame. Check current price. Here you have a durable 14 gauge frame which ensures you’ll use it for long. This quality frame work also makes your ride balanced. There are rubbers on the base that prevent the bike from rocking too much when you pedal. This brand has been around since the 1950s which should give you some assurance that this is a quality product made by people who understand what consumers need. There are five different height options. This is more than many other models so you’re more likely to find a comfortable position to exercise in. It would have been even better if the seat was more luxurious and soft though. Check current price. 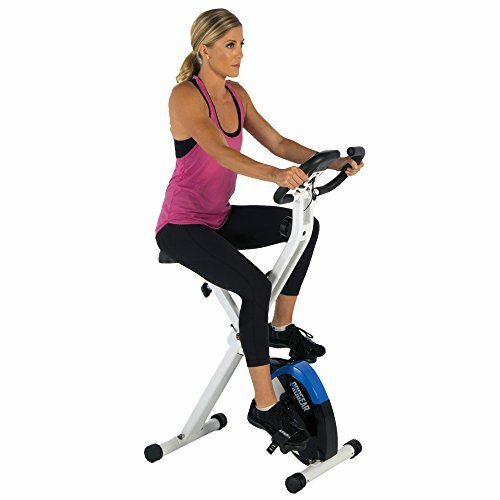 This exercise bike can be used by most people whether you’re a beginner or an experienced athlete. 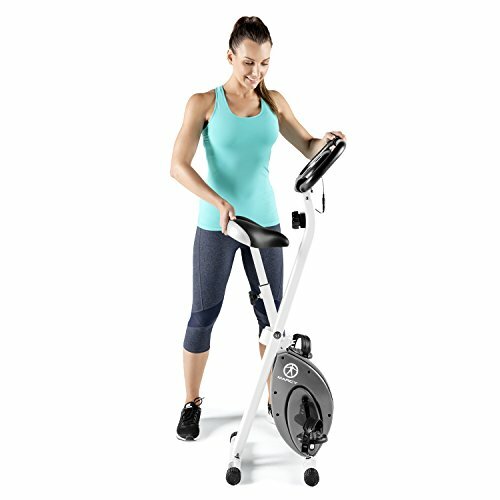 There are many settings to pick from and the sturdy frame will cope with a hectic exercise routine effortlessly. To make your session more comfortable and effective the pedals are ergonomically designed. The straps are adjustable, so you can get a perfect fit which means you focus on your routine instead of worrying about losing your footing. It’s another Marcy product so you’re guaranteed a quality design. This bike impresses even more than the previous model since you get nine different height positions to pick from. Just note that this simpler design doesn’t have any pulse measuring features. Check current price. It’s always encouraging when brands do their market research and realize what consumers need. We all live with our mobile devices within reach at all times right? 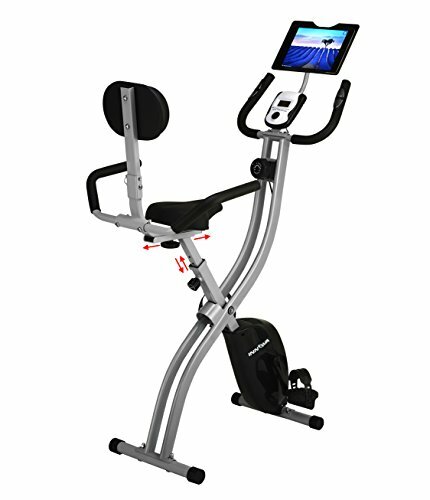 On this bike you can place your tablet or iPad in the provided holder. Whether you use it for work or entertainment while you pedal hard, this is a user-friendly feature we love. This design works with precision dual flywheels and a multi crank. There’s very little noise once you get going. The sturdy S-style frame is a simple design that folds up compact enough for easy storage. Check current price. 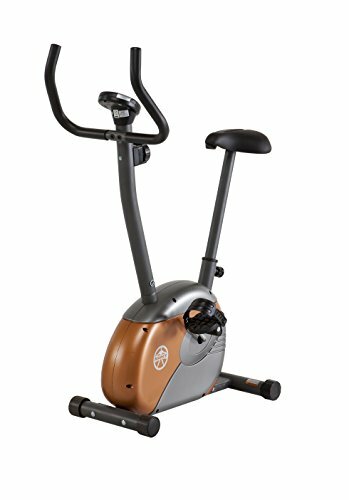 We end this list with a great all round exercise bike. 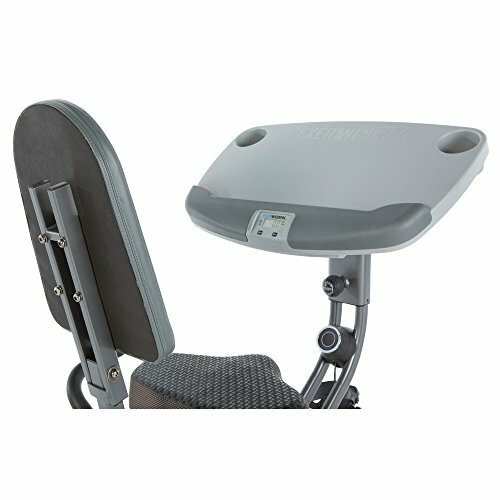 This model from ProGear is appropriate for most people as even short individuals find it comfortable. It’s a basic design at a reasonable price, but it doesn’t have a very impressive weight capacity. A bonus is that your get heart pulse monitors. The LCD display will also show you calories burned, your speed and the time & distance you covered in your session. It’s compact enough that it’s a smart option for people living in tiny apartments but still versatile. However, it may not provide sufficient resistance for serious training. The seat design can be improved upon, so it will stay comfortable even if you’ve been sitting for a while. Check current price. That’s a lot of information and you need to gauge which one will be most sufficient for you. That’s when you make a list of the factors below. Pick the ones most relevant to your lifestyle and preferences. Prioritize those and look for models that will give you the most of what you need. 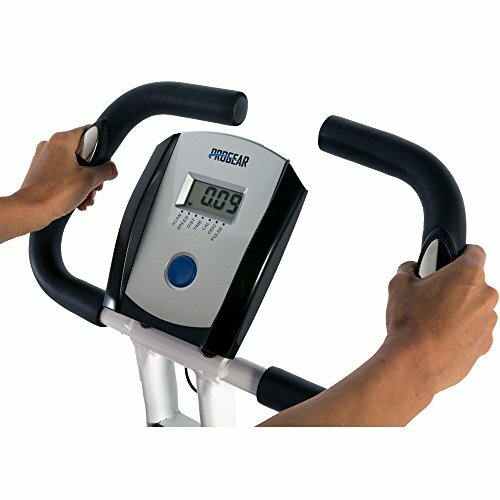 You’re going to place this fold away exercise bike under pressure from regular use and you want a long-term investment. That’s why the bike’s construction should be at the top of everyone’s lists. Make sure a heavy-duty substance such as steel was used for its manufacturing. Construction will also influence the warranty period of the bike. Since it has moving parts there will inevitably be wear and tear over time. Make sure the brand will cover defects for a long time, so you don’t have to spend too much money on the upkeep in the first few years. Of course, your home has a unique layout and you only have so much closet space. Note that not all of these bikes are the same size. Somewhere is the folding exercise bike that will fit in your space. Start your shopping by measuring your available space and then looking for a model that will fit those dimensions. 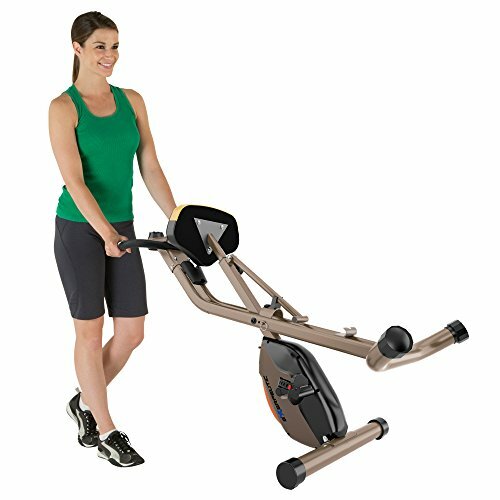 Don’t worry—these foldup exercise bikes are designed to carry considerable weight even up to 300lb or 400lb. Just look for one that suits your weight so you don’t damage the bike and let it wear out quicker than expected. You’re going to spend hours on that seat so it needs to be comfortable. Luckily manufacturers usually supply you with a well padded surface that’s comfortable for both men and women. Another aspect you should consider is how high this seat will be: Will you be able to easily get on and off it? The seat also matters when you decide between traditional bikes and recumbent bikes. In the latter the seat is much closer to the ground and you may even have a back rest connected to your seat. This is an ideal option to invest in for older individuals or if you have back problems. You must ensure the settings cater to your level of fitness. If you’re still a beginner, you may find a professional bike meant for intense training too hard to cycle on. You can even hurt yourself if your muscles aren’t up to the task yet. This is where you must gauge your priorities and needs so you don’t pay for features you won’t really use. 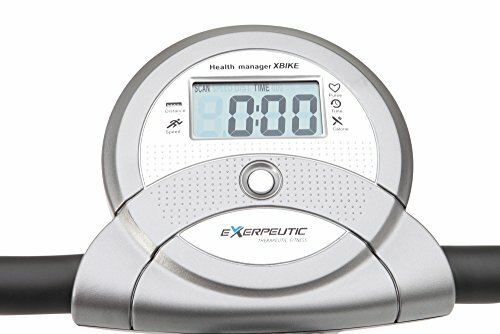 Of course, you need a display and controls to manage your exercise session. You can pick a basic design, but some people may prefer an advanced layout with many options and more feedback such as heart rate & calories burnt. But if you already have a body sensor that works via your SmartPhone why waste money on another one? Determine what you need and shop accordingly. Modern technology made these folding bikes virtually silent so most of them won’t bother those around you. Will you be irritated by the sound yourself or will it disrupt your concentration during your session? Then it’s worthwhile to invest in a whisper soft model. Luckily these types are becoming more available and cheaper in price. There are no excuses anymore. Are you ready to take your exercise routine to the next level? With one of these you can do it without ruining the aesthetics of your home and without even leaving your house.